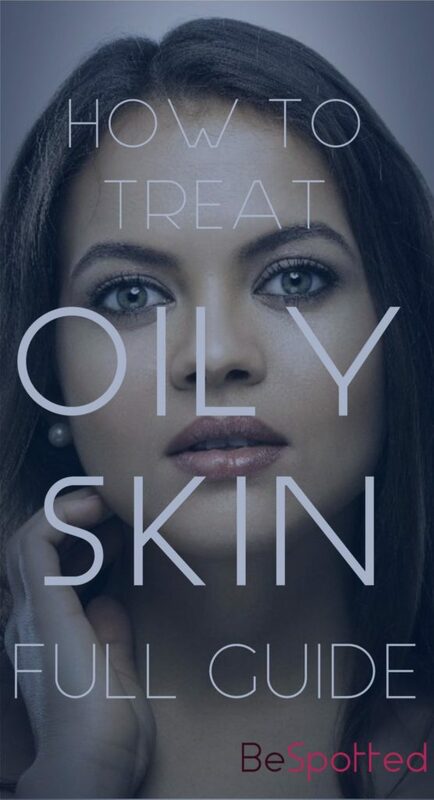 Published February 21, 2018 by Jovana R.
You don’t have to be a cosmetician to recognize an oily face – it is visible and obvious, which often makes it least appealing of all skin types. You can easily test whether your skin is oily by washing it, wait for an hour, then press a tissue to your face. Oily face will leave greasy marks on the tissue, especially in the forehead, nose and cheekbone areas. Oily face is shiny and… well, oily, obviously. It goes hand in hand with enlarged pores, blackheads and acne. Makeup doesn’t stick for long. The problem intensifies during summer, when too much sun, warmth and pool water increase oil and sebum production. Its only advantage over other skin types is that wrinkles don’t appear easy on a skin covered in oil. Oily face usually ages better than any other skin type. What Causes Oily Face Skin? Genetics – Just like anything else in our body, the structure of our skin is determined by genetics. By extension, your genes will determine what problems and irregularities your skin will be prone to. Hormones – Certain hormones increase sebum production. Puberty, menstrual cycle and pregnancy, stress and certain hormonal imbalances and diseases can all aggravate oily face. Food – The food we eat have a great impact on the state of our skin. The right food supplies your skin with all the necessary things and makes your job a lot easier, while bad eating habits make the problem a lot worse. Hygiene habits – Although bad hygiene or incorrect usage of cosmetics technically doesn’t cause oily face skin, it can make the problem worse. Ultimately, whether your skin will be extremely oily or the oiliness will be under control depends on how you are taking care of it. The number one mistake girls with oily face skin make is over-cleansing it. Not that you shouldn’t clean your face, you should – to a certain extent. Though washing your face regularly is mandatory, too much of it can be contra-effective. The reason for this is simple – removing too much sebum can stimulate your sebaceous glands to produce even more oil to compensate the difference. Besides, you shouldn’t remove all sebum and oils anyway. Remember that sebum is not a bad thing. It is in charge of keeping your skin hydrated. Only the increased production of sebum causes the problems. Washing your face twice a day should be quite enough. Most cosmeticians agree that warm water is the best solution in this case. Though cold water may temporarily cause your face to look nicer by shrinking the pores, hot water better deals with the basis of the problem. It will enlarge the pores, so more dirt and excess oil will be removed. Then you can use an ice cube and slowly glide it over your face. That way you get the best of both. The soaps that dry out the skin too much won’t help at all. Avoid anything too foaming or too aggressive. Try to find some light lotion based on natural ingredients. Avoid products with alcohol and instead focus on the ones that contain salicylic acid, glycolic acid, benzoyl peroxide, AHA and BHA. Sadly, studies show that many girls don’t use toner on a regular basis. Face toner is crucial for healthy, balanced skin. It will remove what cleansing may have left behind, but its role spreads beyond that. Toner balances the pH of the skin, keeps the oily face matte and refreshes it. For oily skin, you can find toners that specifically regulate enlarged pores. A good choice for you could also be micellar water. Micellar water is thorough but gentle and doesn’t irritate the skin. Should You Use Facial Cream? It is a common misconception that oily face skin doesn’t require hydration. This skin type can be very dehydrated and needs regular moisturizing. Use light moisturizers, preferably in a form of gel or serum, twice a day. Choose non-comedogenic products, they will not clog your pores. Opt for a water based moisturizer (oil free) that mattes the skin and makes it shine less. Products with hyaluronic acid are a great option for you – they will hydrate your skin without making it more oily. Oily skin often includes dealing with enlarged pores. As soon as all of the oil, dirt, dead skin cells and bacteria start clogging your pores, acne and blackheads appear. On top of that, oily face skin can be prone to flaking. Organic cosmetics are the best solution for this problem. Make your own scrubs based on fruit enzymes – citruses are a great option, just make sure not to over use them because they can be pretty strong. Another kind of scrub perfect for oily face is gentle mechanical scrub that has a texture of a fine powder, like oatmeal flour. The tiny particles are good in collecting extra oil. Treat your face with a scrub once or twice a week. When you are choosing masks for oily face, choose those that can collect the oil and have a detoxifying effect. As with scrubs, you can completely DIY this part. Green clay is irreplaceable in this case, or kaolin clay if green clay is too strong for your skin. Another important role of the mask is to replenish water, vitamins and minerals your skin doesn’t get through regular skincare routine. For this skin type heavy masks based on oils won’t do much; instead try out yogurt, apples, honey, cucumbers or this amazing Strawberry & Aloe Vera Face Mask. Like scrubs, homemade masks give astonishing results once you find the one that is perfect for you. The basic rule would be to use as little makeup as you can. But, since that won’t happen, at least do it properly. First, make sure that your face is completely clean before applying foundation. You can even treat enlarged pores with an ice cube to shrink them and prevent the foundation from sinking into them. Next, choose a foundation that is light and oil-free, contain herbal extracts and controls sebum production. BB creams are definitely worth trying out, but avoid the ones that contain mineral oils. Apply as thin layer of liquid foundation as possible and finish with face powder that will reduce the shine. And the most important rule – don’t ever, ever, EVER go to bed with the makeup still on. There is no makeup that could replace balanced, diverse meals and regular hydration. So, while nurturing your skin with the products above, do not forget to adjust your eating habits to your skin’s needs. Drink at least 8 cups of water (or unsweetened green tea) a day. Vegetables, like carrot and spinach, as well as almonds and oysters are rich in zinc and should be included in your everyday menu. Eat yellow fruit (oranges, peaches, apricots, melons). As for big no nos, avoid carbs, greasy and spice food and limit caffeine. You probably hate to hear it as much as I do, but these things can severely worsen your oily face skin.